It’s time to travel back to 1971 and Medicom has your ticket back to the past with their take on a Kamen Rider 1, pre-orders have just opened up for the RAH Genesis Kamen Rider 1 & Cyclone Ultimate Edition Set! 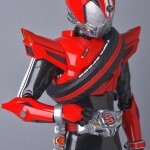 As the name implies, this massive set will include both Kamen Rider 1 and his trusty motorcycle: The Cyclone. 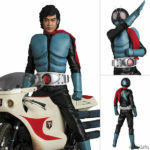 An assortment of optional hands will be included, along with an alternate head depicting actor Hiroshi Fujioka in his iconic role as Takeshi Hongo. 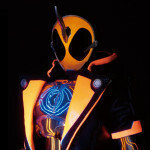 In addition, both belt and motorcycle will have a built-in LED gimmick. All of this can be yours for a relatively steep cost of 56,650 yen. (Approximately 517.49 USD as of this writing) you can look forward to this figure sometime in September 2019. In the meantime, head on over to AmiAmi and reserve yours today. With RAH Kamen Rider Build Tank Rabbit Form releasing later this month, the time seems perfect to follow up with the new Rider on the block. 1/6th scale collectors rejoice! For our Lord, Kamen Rider Zi-O has come to Medicom’s Real Action Heroes line of high-end toys. RAH Kamen Rider Zi-O recreates the stunt suit with exquisite detail, everything right down the belt and even the Ride Watch is painted. Kamen Rider Zi-O’s signature weapon the Jikan Grade is included in both sword and gun modes, along with a watch-themed display base and a nifty light-up feature in the eyes. For now, there’s no price or release date as all photos came data mined courtesy of Tokullector via Twitter. We’ll be sure to update you as that info becomes available. Thanks to an update from Figsoku.net, we now know that RAH Kamen Rider Zi-O will be coming out October 2019, retailing for 35,640 yen. 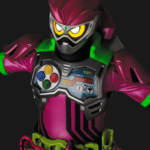 Medicom’s just announced the latest of their high end Real Action Heroes Genesis figures, and it’s none other than Kamen Rider Ex-Aid Action Gamer Level 2 . 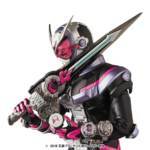 RAH Genesis Kamen Rider Ex-Aid Level 2 like his predecessors will feature a light up LED gimmick built into the head. Accessories includes the Gashacon Breaker in both Blade and Hammer modes, two holdable Gashats, a personalized display stand, a Hit effect part, and a personalized display base. All this can be yours for a whopping 30,000 yen but it won’t see release till November 2017. While the S.H.Figuarts release of Kamen Rider Amazon Omega maybe still a month off, Medicom’s gone ahead and put up official stock images for their RAH Genesis Kamen Rider Amazon Omega high end figure! RAH Genesis Kamen Rider Amazon Omega is certainly a gorgeous piece, included with this figure are his Battle Grip weapon in both sickle and spear modes, extended forearm blades for the Violent Punish finisher, a personalized display base and to top it all off: the eyes will have an light up LED gimmick. RAH Genesis Kamen Rider Amazon Omega will command a high price tag of 29,800 yen but he won’t be due out for awhile: he’s expected to come out May 2017 as a mass retail release. The S.H. 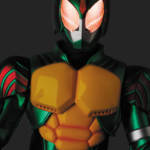 Figuarts version of Kamen Rider Amazon Alpha will be going up for preorder very soon, but for those who want something a little more high end for the Kamen Rider Amazons star Medicom have you covered. 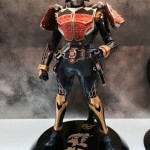 Revealed at this year’s Summer Wondefest, the Medicom Real Action Heroes Kamen Rider Amazon Alpha looks to be every bit as detailed as previous entries in the line. Pricing and release date are yet to be revealed, so stay tuned to Tokunation as more information is announced! RAH Rider 1 and Cyclone Revealed Ghost Previewed! 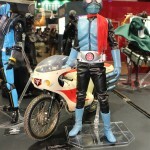 Yet another reveal’s come straight out of Winter Wonder Festival with a preview of Real Action Heroes Kamen Rider 1 and the Cyclone motorcycle having been just revealed. While their currently is no word on when either of these two will be release, Wonder Festival did have something else for us with our first in hand look at RAH Genesis Ghost Ore Damashii being on display with the LEDs in full effect, having been teased sometime ago. Ghost himself is set for release in November 2016 with a price tag of 35,000 yen. Hot off the heels of last year’s Drive Type Speed, Medicom just unveiled the next RAH Genesis 1/6th release with RAH Genesis Ghost Ore Damashii currently in the works. Unlike the smaller Figuarts version coming out in April, RAH Genesis Ghost will have a light up LED feature in addition to having a functional Ghost Driver with swappable Musashi and Ore Damashii Eyecons, the GanGan Sabre, and a custom display stand personalized with his symbol. All of this will retail for a rather pricey 35,000 yen before shipping, the piece will be shipping out in November 2016. ORANGE ARMS! THE PATH TO BLOSSOM, ON STAGE! Thanks to AmiAmi, we finally have an official production gallery and release info for the upcoming RAH Genesis Gaim figure which was revealed a few days ago. RAH Genesis Gaim Orange Arms will run you a whopping 29,800 yen before shipping and taxes. The good news? The figure won’t be released till April 2016, so start saving! RAH Genesis Gaim includes all the accessories you’d expect him too: both his Daidaimaru and Musou Saber are well detailed along with replicas of the Strawberry and Pineapple Lock Seeds. Much like Drive, Gaim’s helmet will have a light up LED gimmick as well as a custom display base. 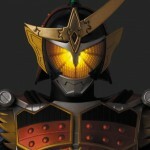 Finally, Medicom will be bringing the fan favrioute Kamen Rider Gaim to the high end Real Action Heroes Genesis line! 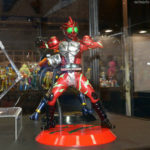 RAH Gensis Gaim Orange Arms was revealed at their very own Medicom Toy Exhibition, though at the moment there isn’t any release details avalaible for him. Medicom just recently released a plethora of new images for their upcoming Medicom RAH Genesis Kamen Rider Drive Type Speed 1/12th scale high end figure. The piece’s detailing is shown off extensively, and we’re even given a look at his parts count: along with optional hands, RAH Drive will include the Max Flare Tire and Shift Car along with alternate Type Speed Shift cars and different pieces to change up how the Drive Driver looks when in use. At the moment, there’s still no word on it’s release info so we currently don’t know if it’ll be released at mass retail or a limited run web exclusive.